Not to be confused with Adaptive Combat Rifle. 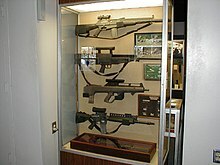 Phase III began in August 1989, when AAI, Colt, HK, and Steyr entered weapon testing. ^ "Objective Infantry Combat Weapon". Archived from the original on 2000-05-27. Retrieved 2007-07-16.